Reports began to filter in from North Carolina. Blackbeard had entered Ocracoke Inlet with his latest prize. Even more disturbing was the information that the pirate had indicated that he was planning to fortify the shore of that place and develop it into something of a pirate’s refuge or haven. At this time two British warships were lying at anchor in the James River. One was the Pearl under a Captain Gordon; the other, the Lyme, was commanded by Captain Ellis Brand. Although these men-of‑war carried the necessary fire-power to blast the pirates out of the water, they were much too large and drew too much water to navigate the shallow waters of North Carolina’s sounds and inlet. Governor Spotswood was determined to dispatch an expedition to capture Blackbeard. Yet he wanted to keep it secret, and therefore could not request the legislature for the necessary funds. Two fast and light sloops were hired with money from his own pocket. Two pilots familiar with the shoal waters of Ocracoke were also employed. But what about a crew? Seamen were plentiful, but it was going to take a trained fighting crew to capture the pirate. Captains Gordon and Brand agreed to man the sloops with sailors from the Pearl and the Lyme. Sixty men were selected. Lieutenant Robert Maynard of the Pearl was given command of the larger sloop, which was nameless in the official dispatches, while the first officer of the Lyme was in charge of the smaller vessel, the Ranger. Captain Ellis Brand was given the overall command and direction of the expedition. Governor Spotswood persuaded the legislature to offer a reward for the capture of Blackbeard and his men. Even then, he did not reveal the purpose of his expedition. Captain Brand hurried to Bath. The two sloops, on November 17, 1718, quietly weighed anchor and slipped out of Chesapeake Bay into the Atlantic Ocean. A course was set for Ocracoke Inlet. Near dusk on the evening of November 21, the Ranger with its companion sloop steered into the inlet. Blackbeard’s Adventure was anchored in open water. Maynard dropped anchor and waited for daylight to launch an attack. The appearance of an enemy was no surprise to the pirate. Tobias Knight had thoughtfully dispatched a letter which warned of the possibility of such an expedition. Edward Teach, the terror of the seas, worried little what the morning might bring. He feared no one. Unlike Maynard, who spent the night preparing for the next day’s struggle, Blackbeard spent most of the night carousing in his cabin with the captain of a nearby merchant vessel. Lieutenant Maynard attacked with the sun. Small boats were put overboard. These were to explore the interval between the ships and take soundings. Maynard would take no risk of running aground. As these rowboats came within range of the Adventure, they were greeted with a round of shot. They scurried back to the protection of the sloops. Maynard ordered the smaller of his ships to slip in close to the pirates and board their ship. The larger sloop followed but soon found herself stuck hard and fast on a sandbar. Ballast was thrown overboard, and she was soon light enough to float once more. By this time the Ranger had also run aground and was now definitely out of the fight. Maynard’s sloop had to carry the fight to the enemy alone. The pirate captain shouted an invitation to send over a boat so that he might see who they were. With this “the black Ensign with the Death’s Head” was run up to masthead, the anchor cable was cut, and sails quickly hoisted. The first pirate broadside was directed at the Ranger whose crew were still working feverishly to re-float her from the sandbar on which she was stuck. The commanding officer and several of his seamen were instantly killed. Pulling around quickly, the next cannon blast was loosed at Maynard’s sloop. The ship was not armed with cannon, and her men could return the fire only by popping away with muskets. The wind died down. Maynard had to get in close before the pirate cannon blasted him right out of the water. The sweeps, or heavy oars, were broken out, and the large sloop was slowly worked towards the Adventure. Another pirate broadside tore into the men at the sweeps. A number of the men were killed or badly wounded, some reports listing as many as 21. As the pirates scrambled over the gunwales, Maynard and his men burst from the hold. All was confusion. 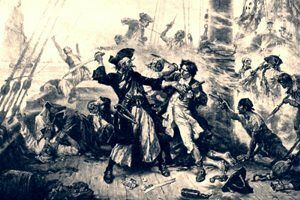 Amidst the shouts, the cracking of pistol shots, the clatter of swinging cutlasses, and the cries of wounded men, Blackbeard and Maynard met face to face. Both fired their pistols at almost the same instant. Blackbeard missed. The ball from Maynard’s weapon plunged into the pirate’s body. It failed to stop him and hardly slowed him down. Both men began to swing their heavy swords. A powerful sweep of Blackbeard’s weapon snapped Maynard’s cutlass like a twig. The mighty arm drew back to deliver the death blow. Just in the nick of time, one of Maynard’s men stepped in and slashed the throat of the pirate. Maynard received a blow across the knuckles. Still, the powerful Blackbeard fought on. He pulled another pistol from his belt. While still in the act of cocking the weapon, he suddenly toppled over dead upon the deck. Twenty-five wounds, five of which were pistol balls, had finally sapped the life from his magnificent body. Edward Teach had died just as hard as he had lived.